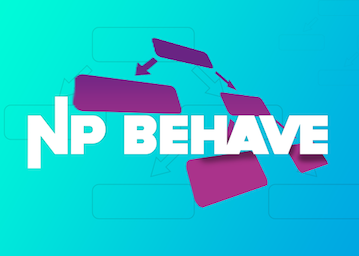 NPBehave builds on the powerful and flexible code based approach to define behavior trees from the BehaviorLibrary and mixes in some of the great concepts of Unreal’s behavior trees. Unlike traditional behavior trees, event driven behavior trees do not need to be traversed from the root node again each frame. They stay in their current state and only continue to traverse when they actually need to. This makes them more performant and a lot simpler to use. In NPBehave you will find most node types from traditional behavior trees, but also some similar to those found in the Unreal engine. Please refer to the Node Type Reference for the full list. It’s fairly easy to add your own custom node types though. If you don’t know anything about behavior trees, it’s highly recommended that you gain some theory first, this Gamasutra article is a good read. Just drop the NPBehave folder into your Unity project. There is also an Examples subfolder, with some example scenes you may want to check out. Up until now there really isn’t anything event driven in this tree. Before we can dig into this, you need to understand what Blackboards are. In NPBehave, like in Unreal, we got blackboards. You can think about them as beeing the “memory” of your AI. In NPBehave, blackboards are basically dictionaries that can be observed for changes. We mainly use Service to store & update values in the blackboards. And we use BlackboardCondition or BlackboardQuery to observe the blackboard for changes and in turn continue traversing the bahaviour tree. Though you are free to access or modify values of the blackboard everywhere else (you’ll also access them often from Action nodes). This sample will swap between printing “foo” and “bar” every 500 milliseconds. We use a Service decorator node to toggle the foo boolean value in the blackboard. We use a BlackboardCondition decorator node to decide based on this flag whether the branch gets executed or not. The BlackboardCondition also watches the blackboard for changes based on this value and as we provided Stops.IMMEDIATE_RESTART the currently executed branch will be stopped if the condition no longer is true, also if it becomes true again, it will be restarted immediately. Please note that you should put services in real methods instead of using lambdas, this will make your trees more readable. Same is true for larger actions. Some Decorators such as BlackboardCondition, Condition or BlackboardQuery have a stopsOnChange parameter that allows to define stop rules. The parameter allows the Decorator to stop the execution of a running subtree within it’s parent’s Composite. It is your main tool to make power of the event-drivenness in NPBehave. A lower priority node is a node that is defined after the current node within it’s parent Composite. The most useful and commonly used stops rules are SELF, IMMEDIATE_RESTART or LOWER_PRIORITY_IMMEDIATE_RESTART. Be careful if you’re used to Unreal though. In NPBehave BOTH and LOWER_PRIORITY have a slightly different meaning. IMMEDIATE_RESTART actually matches Unreal’s Both and LOWER_PRIORITY_IMMEDIATE_RESTART matches Unreal’s Lower Priority. Stops.NONE: the decorator will only check it’s condition once it is started and will never stop any running nodes. Stops.SELF: the decorator will check it’s condition once it is started and if it is met, it will observe the blackboard for changes. Once the condition is no longer met, it will stop itself allowing the parent composite to proceed with it’s next node. Stops.LOWER_PRIORITY: the decorator will check it’s condition once it is started and if it’s not met, it will observe the blackboard for changes. Once the condition is met, it will stop the lower priority node allowing the parent composite to proceed with it’s next node. Stops.BOTH: the decorator will stop both: self and lower priority nodes. Stops.LOWER_PRIORITY_IMMEDIATE_RESTART: the decorator will check it’s condition once it is started and if it’s not met, it will observe the blackboard for changes. Once the condition is met, it will stop the lower priority node and order the parent composite to restart the Decorator immediately. Stops.IMMEDIATE_RESTART: the decorator will check it’s condition once it is started and if it’s not met, it will observe the blackboard for changes. Once the condition is met, it will stop the lower priority node and order the parent composite to restart the Decorator immediately. As in BOTH it will also stop itself as soon as the condition is no longer met. In NPBehave you define your behavior tree within a MonoBehaviour, as thus it isn’t necessary to store everything in the blackboard. If you don’t have BlackboardDecorator or BlackboardQuery with other stop rules than Stops.NONE, you probably don’t need them to be in the blackboard at all. You can also just make use of plain member variables - it is often the cleaner, faster to write and more performant. It means that you won’t make use of the event-drivenness of NPBehave in that case, but it’s often not necessary. use a regular Condition decorator. This decorator has an optional stopsOnChange stops rules parameter. When providing any other value than Stops.NONE, the condition will frequently check the condition and interrupt the node according to the stops rule when the result of the given query function changes. Be aware that this method is not event-driven, it queries every frame (or at the provided interval) and as thus may lead to many queries if you make heavy use of them. However for simple cases it is often is sufficient and much simpler than a combination of a Blackboard-Key, a Service and a BlackboardCondition. Build your own event-driven Decorators. It’s actually pretty easy, just extend from ObservingDecorator and override the isConditionMet(), StartObserving() and StopObserving() methods. In NPBehave a node can either succeed or fail. Unlike traditional behavior trees, there is no result while a node is executing. Instead the node will itself tell the parent node once it is finished. This is important to keep in mind when you create your own node types. the root node: The root has one single child and is used to start or stop the whole behavior tree. composite nodes: these have multiple children and are used to control which of their children are executed. Also the order and result is defined by this kind of node. task nodes: these are the leafs of the tree doing the actual work. These are the ones you most likely would create custom classes for. You can use the Action with lambdas or functions - For more complicated tasks, it is often a better option to create a new subclass of Task. Be sure to read the the golden rules if you do so. You can use the Debugger component to debug the behavior trees at runtime in the inspector. You have the option to share blackboards across multiple instances of an AI. This can be useful if you want to implement some kind of swarm behavior. Additionally, you can create blackboard hierarchies, which allows you to combine a shared with a non-shared blackboard. You can use UnityContext.GetSharedBlackboard(name) to access shared blackboard instances anywhere. Please refer to the existing node implementations to find out how to create custom node types, however be sure to at least read the following golden rules before doing so. Every call to DoStop() must result in a call to Stopped(result). This is extremely important! : you really need to ensure that Stopped() is called within DoStop(), because NPBehave needs to be able to cancel a running branch at every time immediately. This also means that all your child nodes will also call Stopped(), which in turn makes it really easy to write reliable decorators or even composite nodes: Within DoStop() you just call Stop() on your active children, they in turn will call of ChildStopped() on your node where you then finally put in your Stopped() call. Please have a look at the existing implementations for reference. Stopped() is the last call you do, never do modify any state or call anything after calling Stopped. This is because Stopped will immediately continue traversal of the tree on other nodes, which will completley fuckup the state of the behavior tree if you don’t take that into account. Every registered clock or blackboard observer needs to be removed eventually. Most of the time you unregister your callbacks immediately before you call Stopped(), however there may be exceptions, e.g. the BlackboardCondition keeps observers around up until the parent composite is stopped, it needs to be able to react on blackboard value changes even when the node itself is not active. For tasks you extend from the Task class and override the DoStart() and DoStop() methods. In DoStart() you start your logic and once you’re done, you call Stopped(bool result) with the appropriate result. Your node may get cancelled by another node, so be sure to implement DoStop(), do proper cleanup and call Stopped(bool result) immediately after it. For a relatively simple example, check the source of the Wait Task. As already mentioned in the golden rules section, in NPBehave you have to always call Stopped(bool result) after your node is stopped. So it is currently not supported to have cancel-operations pending over multiple frames and will result in unpredictable behaviour. Writing decorators is a lot more complex than Tasks. However a special base class exists for convenience. It’s the ObservingDecorator. This class can be used for easy implementation of “conditional” Decorators that optionally make use stopsOnChange stops rules. All you have to do is to extend from it ObservingDecorator and override the method bool IsConditionMet(). If you want to support the Stops-Rules you will have to implement StartObserving() and StopObserving() too. For a simple example, check the source of the Condition Decorator. For generic decorators you extend from the Decorator class and override the DoStart(), DoStop() and the DoChildStopped(Node child, bool result) methods. You can start or stop your decorated node by accessing the Decoratee property and call Start() or Stop() on it. If your decorator receives a DoStop() call, it’s responsible to stop the Decoratee accordingly and in this case will not call Stopped(bool result) immediately. Instead it will do that in the DoChildStopped(Node child, bool result) method. Be aware that the DoChildStopped(Node child, bool result) doesn’t necessarily mean that your decorator stopped the decoratee, the decoratee may also stop itself, in which case you don’t need to immediately stop the Decoratee (that may be useful if you want to implement things like cooldowns etc). To find out whether your decorator got stopped, you can query it’s IsStopRequested property. Check the source of the Failer Node for a very basic implementation or the Repeater Node for a little more complex one. In addition you can also implement the method DoParentCompositeStopped(), which may be called even when your Decorator is inactive. This is useful if you want to do additional cleanup work for listeners you kept active after your Decorator stopped. Check the ObservingDecorator for an example. Composite nodes require a deeper understanding of the library and you usually won’t need to implement new ones. If you really need a new Composite, feel free to create a ticket on the GitHub project or contact me and I’ll try my best to help you getting through it correctly. ACTIVE: the node is started and not yet stopped. STOP_REQUESTED: the node is currently stopping, but has not yet called Stopped() to notify the parent. INACTIVE: the node is stopped. You can use the clock in your nodes to register timers or get notified on each frame. Use RootNode.Clock to access the clock. Check the Wait Task for an example on how to register timers on the clock. By default the behavior tree will be using the global clock privoded by the UnityContext. This clock is updated every frame. There may be scenarious where you want to have more control. For example you may want to throttle or pause updates to a group of AIs. For this reason you can provide your own controlled clock instances to the Root node and Blackboard, this allows you to precisely control when your behavior trees are updated. Check the Clock Throttling Example. Selector(params Node children): Run children sequentially until one succeeds and succeed (succeeds if one of the children succeeds). Sequence(params Node children): Run children sequentially until one fails and fail (succeeds if non of the children fails). Parallel(Policy successPolicy, Policy failurePolicy, params Node children): Run children in parallel. When failurePolocity is Polociy.ONE, the Parallel will stop (with failing resi;t) as soon as one of the children fails. When successPolicy is Policy.ONE, the Parallel will stop (with succeeding result) when of the children fails. If the Parallel doesn’t stop because of a Policy.ONE it will execute until all of the children are done, then it either succeeds if all children succeeded or fails. Action(Func<bool, Result> multiframeFunc): action that can be ticked over multiple frames (return Result.BLOCKED when your action is not yet ready, Result.PROGRESS when you’re busy with the action, Result.SUCCESS or Result.FAILED when your action failed). Action(Func<Request, Result> multiframeFunc2): similar to above, but Request will give you a state information: Request.START means it’s the first tick to your action or you returned Result.BLOCKED last tick; Request.UPDATE means the last time you returned Request.PROGRESS; Request.CANCEL means that you need to cancel your action and return Result.SUCCESS or Result.FAILED. NavMoveTo(NavMeshAgent agent, string blackboardKey, float tolerance = 1.0f, bool stopOnTolerance = false, float updateFrequency = 0.1f, float updateVariance = 0.025f): move a NavMeshAgent agent to either a transform or vector stored in the given blackboardKey. Allows a tolerance distance to succeed and optionally will stop once in the tolerance range (stopOnTolerance). updateFrequency controls how often the target position will be updated and how often the task checks wether it’s done. WaitUntilStopped(bool sucessWhenStopped = false): just wait until stopped by some other node. It’s often used to park at the end of a Selector, waiting for any beforehead sibling BlackboardCondition, BlackboardQuery or Condition to become active. BlackboardCondition(string key, Operator operator, object value, Stops stopsOnChange, Node decoratee): execute the decoratee node only if the Blackboard’s key matches the op / value condition. If stopsOnChange is not NONE, the node will observe the Blackboard for changes and stop execution of running nodes based on the stopsOnChange stops rules. BlackboardCondition(string key, Operator operator, Stops stopsOnChange, Node decoratee): execute the decoratee node only if the Blackboard’s key matches the op condition (for one operand operators that just check for IS_SET for example). If stopsOnChange is not NONE, the node will observe the Blackboard for changes and stop execution of running nodes based on the stopsOnChange stops rules. BlackboardQuery(string keys, Stops stopsOnChange, System.Func<bool> query, Node decoratee): while BlackboardCondition allows to check only one key, this one will observe multiple blackboard keys and evaluate the given query function as soon as one of the value’s changes, allowing you to do arbitrary queries on the blackboard. It will stop running nodes based on the stopsOnChange stops rules. Condition(Func<bool> condition, Stops stopsOnChange, Node decoratee): execute decoratee node if the given condition returns true. Re-Evaluate the condition every frame and stop running nodes based on the stopsOnChange stops rules. Condition(Func<bool> condition, Stops stopsOnChange, float checkInterval, float randomVariance, Node decoratee): execute decoratee node if the given condition returns true. Reevaluate the condition at the given checkInterval and randomVariance and stop running nodes based on the stopsOnChange stops rules. Cooldown(float cooldownTime, float randomVariation, bool startAfterDecoratee, bool resetOnFailiure, Node decoratee) Run decoratee immediately, but only if last execution wasn’t at least past cooldownTime with randomVariation. When startAfterDecoratee is true, the cooldown timer will be started after the decoratee finishes instead of when it starts. When resetOnFailure is true, the cooldown will be reset if the decorated node fails. Failer(Node decoratee): always fail, regardless of the decoratee's result. Inverter(Node decoratee): if decoratee succeeds, the inverter fails and if the decoratee fails, the inverter succeeds. Observer(Action onStart, Action<bool> onStop, Node decoratee): runs the given onStart lambda once the decoratee starts and the onStop(bool result) lambda once the decoratee finishes. It’s a bit like a special kind of Service, as it doesn’t interfere in the execution of the decoratee directly. Random(float probability, Node decoratee): runs the decoratee with the given probability chance between 0 and 1. Repeater(int loopCount, Node decoratee): execute the given decoratee for loopCount times (0 means decoratee would never run). If decoratee stops the looping is aborted and the Repeater fails. If all executions of the decoratee are successful, the Repeater will succeed. Service(Action service, Node decoratee): run the given service function, start the decoratee and then run the service every tick. Service(float interval, Action service, Node decoratee): run the given service function, start the decoratee and then run the service at the given interval. Service(float interval, float randomVariation, Action service, Node decoratee): run the given service function, start the decoratee and then run the service at the given interval with randomVariation. TimeMax(float limit, bool waitForChildButFailOnLimitReached, Node decoratee): run the given decoratee. If the decoratee doesn’t finish within the limit, the execution fails. If waitForChildButFailOnLimitReached is true, it will wait for the decoratee to finish but still fail. TimeMax(float limit, float randomVariation, bool waitForChildButFailOnLimitReached, Node decoratee): run the given decoratee. If the decoratee doesn’t finish within the limit and randomVariation, the execution fails. If waitForChildButFailOnLimitReached is true, it will wait for the decoratee to finish but still fail. TimeMin(float limit, Node decoratee): run the given decoratee. If the decoratee finishes sucessfully before the limit time is reached the decorator will wait until the limit is reached and then stop the execution with the result of the Decoratee. If the decoratee finishes failing before the limit time is reached, the decorator will immediately stop. TimeMin(float limit, bool waitOnFailure, Node decoratee): run the given decoratee. If the decoratee finishes sucessful before the limit time is reached, the decorator will wait until the limit is reached and then stop the execution with the result of the Decoratee. If waitOnFailure is true, the decoratee will also wait when the decoratee fails. TimeMin(float limit, float randomVariation, bool waitOnFailure, Node decoratee): run the given decoratee. If the decoratee finishes sucessful before the limit with randomVariation time is reached, the decorator will wait until the limit is reached and then stop the execution with the result of the Decoratee. If waitOnFailure is true, the decoratee will also wait when the decoratee fails.